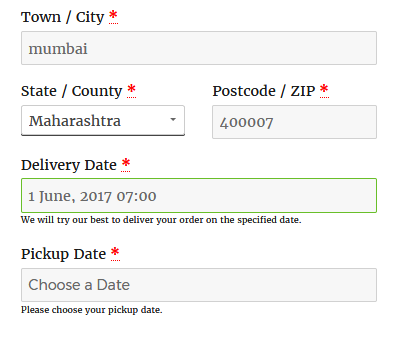 As we are all aware of the functionality that Order Delivery Date Pro for WooCommerce plugin provides, today we shall understand how can you allow customers to choose a Pickup date and time for their order deliveries. This can be made possible by using our Pickup Date Addon. 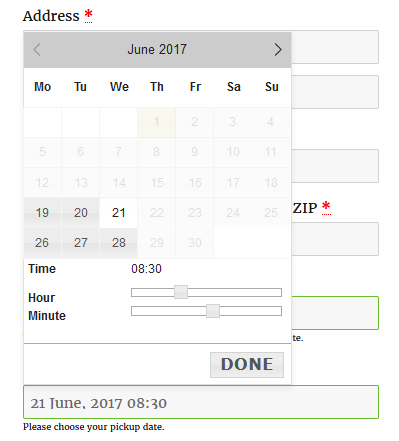 This addon allows the customers to select their desired pick up date and time on the checkout day for that order. In order to make this work, firstly you need to ensure that the plugin version of Order Delivery Date is v6.8 while installing the addon. If the version is below that then this addon will not work. So always look at the version number if at all you face any problem with the addon not working. On Date Settings page you will see a new field is added after activating the addon namely ‘Enable Pickup Date and Pickup Time‘ as shown above. What Functionalities this Addon offers? You can also set time for picking up the order delivery from the Time Settings Page like you do for delivery days. In the similar way, all the other settings of delivery date will be applied on the pickup date like the mandatory field, minimum delivery time in hours, holidays, time settings, time slots everything works same as the delivery date field. 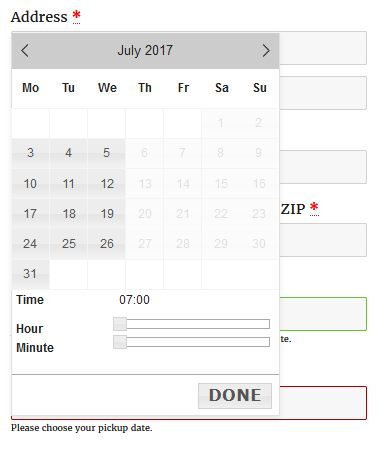 How does a checkout page look like after entering the pickup date and time? So these details will be shown on the checkout page after you click on Place Order button. As you can see above, along with Delivery Date, the Pickup Date and Time is also displayed. This implies that the order was placed today for delivery for which the pickup is arranged for 21st of June at 8.30 am. 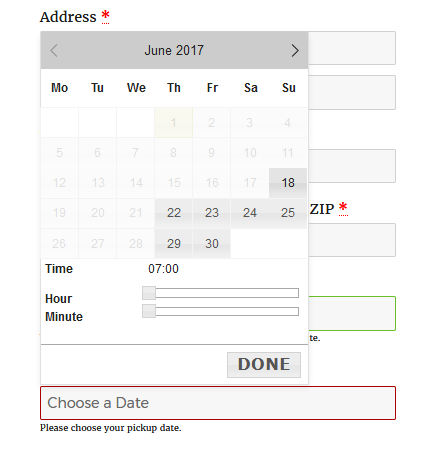 You can see above under the Delivery Date column, there are 2 details displayed, one is delivery date and time and the other one is pickup date and time. This added functionality provides great assistance for rental businesses where the pickup date and time for the goods or services can be set in advance to allow companies to make arrangements accordingly. 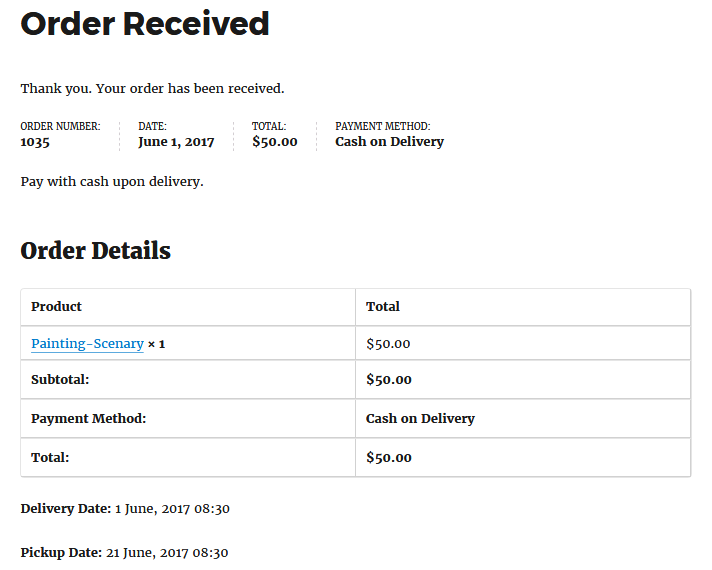 Thus make the most of the Order Delivery Date plugin by using its addon and help increase sales.